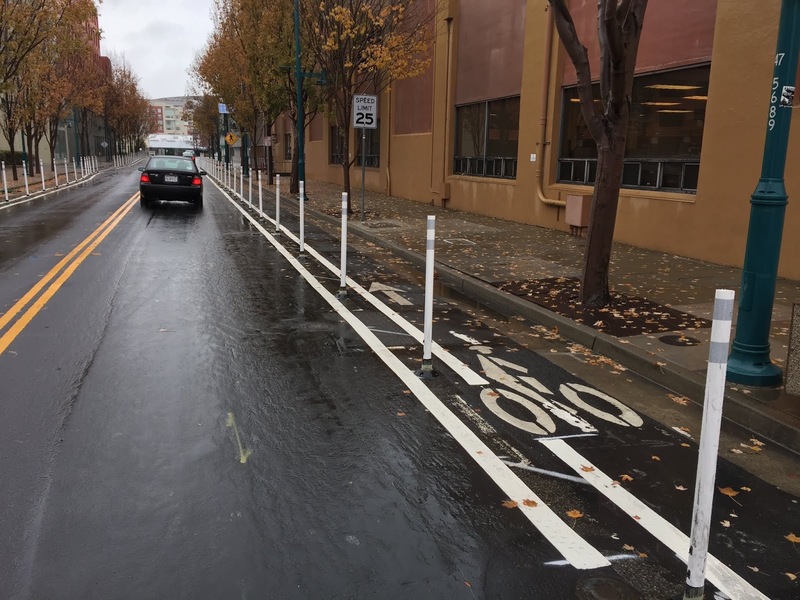 Prompted by a rash of vehicles parking in bike lanes and unwanted interactions between cars and bikes, City Hall has embarked on a program to investigate replacing the City's bike boulevard network with 'protected' bike lanes, the first such segment having been recently completed for a part of Horton Street. The temporary order of business seeks to test physically separating bikes and cars with rubber bollards or concrete 'K rail' in select areas in town as part of a pilot program with an eye towards making the improvements permanent if the City Council and the public finds them acceptable. The use of protected bike lanes represents a major shift in bike transportation policy for Emeryville that since 1998 has embraced an integrationist policy, the idea that bikers are safest when they intermingle with slow moving cars on bike boulevards versus a segregationist policy, also claiming biker safety, that would separate them (in this case with barriers). Vice Mayor Ally Medina, the City Council's Bike/Pedestrian Committee liaison and champion of the new segregationist policy says protected bike lanes are likely the best option and the Bike/Ped Plan is in need of an update to reflect the new way of thinking. Bike boulevards may become a thing of the past, written out of the Bike Plan, if a segregational philosophy becomes the mode of the day in Emeryville. difficult with bollards, impossible with K rail. 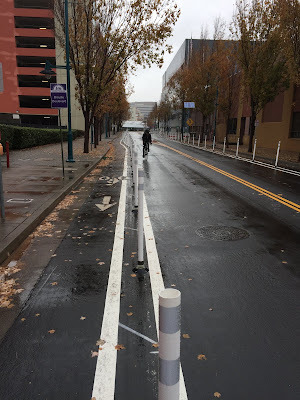 City Hall has not been willing or able to implement bike boulevard provisions in the 20 year old Bike Plan despite its liberal use of purple signs and stencils applied to asphalt declaring specified streets to be bike boulevards. Any change in the Bike Plan to remove them would be historic. The required lowering of vehicle traffic volume that's part and parcel of these boulevards have been a sticking point for City Hall. Regardless that the guiding philosophy of bike boulevards being cars allowed but bikes preferred, Emeryville has encouraged more car traffic on these bike corridors by default, arguing that the extra traffic loading on non-bike boulevard streets in such a case would be unacceptable. Developers worried that lack of easy car access to their projects would lower their value, have added their voices to this chorus. Protected bike lanes inversely, allow as many cars as streets can carry, ensuring maximum developer profits while giving politicians cover; enabling them to claim they are working to increase biker safety by removing bike boulevards. Protected bike lanes are the hottest trend in bike advocacy circles and progressive cities are rushing to install them nationwide, sometimes tripping over themselves to jump on the bandwagon. It's a trend not seen since the rush for bike boulevards by municipalities 20 years ago when they were the hottest trend. trapped in there." 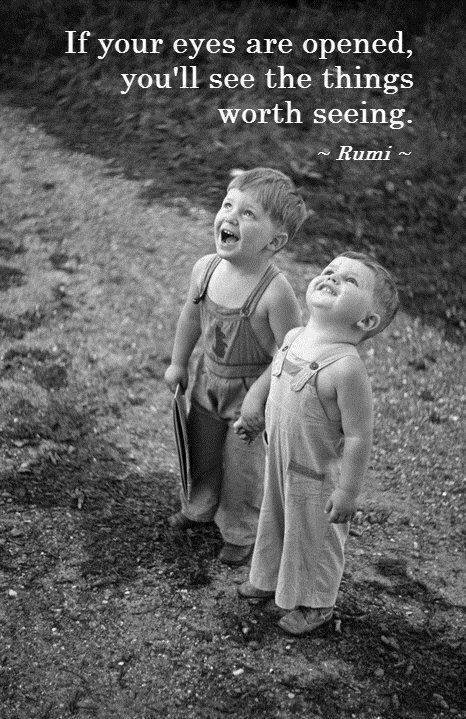 he said. Protagonists point to studies that show how protected bike lanes are safer for urban bikers than either unprotected bike lanes or even bike boulevards. Studies are generally in agreement on the issue of bike safety, at least for travel between intersections. Intersections however remain problematic from a safety perspective and some of the studies reveal that intersections are actually more dangerous for a protected bike lane corridor, owing to higher vehicle speeds and higher vehicle volumes generally associated with protected bike lanes over bike boulevards. 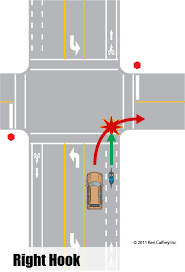 The infamous 'right hook' move, that being vehicles turning right at an intersection crossing over the biker's line of travel, is particularly dangerous in a protected bike lane regime over that of a bike boulevard. The problem stems from the tendency of drivers, not needing to be aware of bikes mid block, suddenly entering into conflict with them at the intersections. Studies show drivers are much more aware of bikers around them on bike boulevards and they tend to drive accordingly, particularly if the bike boulevard vehicle speed and volume are properly attenuated. 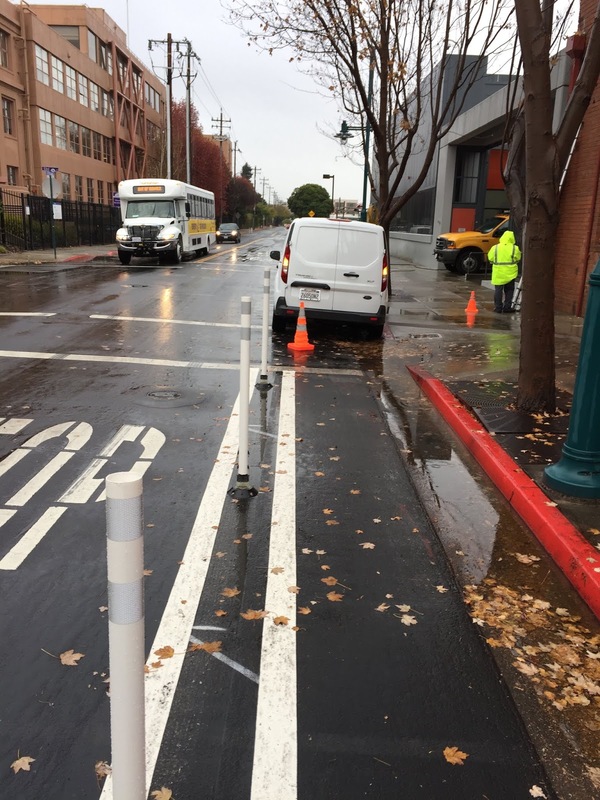 But that has been the problem in Emeryville; there's been a lack of political will to implement the traffic calming measures for our bike boulevards that would make biking safer. Regardless of the fact that bike boulevards are the law of the land in Emeryville for the last 20 years, City Hall has yet to actually try one. 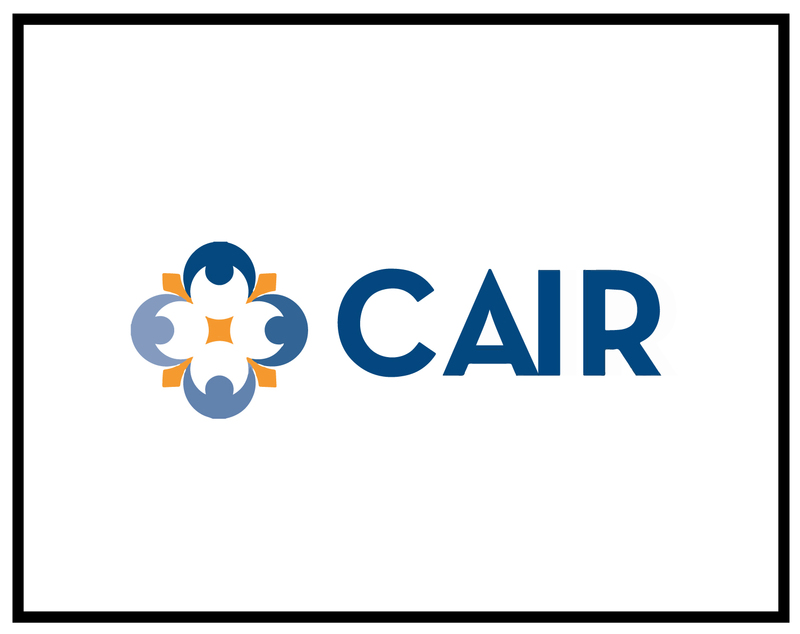 Even still, the City Council is poised to remove them en masse in favor of the new paradigm. Vice Mayor Medina put it bluntly; she told the Tattler she is ready to amend the Bike/Ped Plan to get rid of the boulevards in favor of the protected bike lanes if the pilot program shows public support. That would represent a dramatic break from her colleagues who have steered clear of the controversial move of so amending the Plan, choosing instead over the years, to simply ignore it. The infamous bike lane 'right hook'. Not an issue on bike boulevards. Developers will likely give support to the protected bike lane idea, especially the Sherwin Williams project that will dump thousands of car trips per day on our streets. New renters will likely balk on high rents if it's too difficult for the car drivers to get to and from their homes that would be the case if the bike boulevards concept were to be implemented. Protected bike lanes are agnostic on the issue of vehicle speed and volume and traffic could therefore be more atomized throughout our town rather than it bunching up on the arterial streets as it would in a bike boulevard scenario. Left out of the new equation conspicuously however are pedestrians and people who value 'low and slow' quiet streets. Removing bike boulevards in favor of protected bike lanes fails to accommodate their interests. The higher vehicle speeds and heavier traffic on former bike boulevards morphed into protected bike lane streets are more dangerous to pedestrians at intersections and less aesthetic to lovers of quiet places. Emeryville being Emeryville, even in the age of our new progressive City Council, it is possible these non-developer interests may ultimately not make the cut. Protected Bike Lanes: The hippest thing since sliced bread. Bike boulevards apparently are yesterday's news. The video shows how popular protected bike lanes have become but makes a fatuous claim that vehicle speeds go down on streets with protected bike lanes. Compared with streets with regular bike lanes, vehicle speeds are shown to be higher and compared with bike boulevards, even more so. Bike boulevards are shown to bring down vehicle speeds the most of all bike corridor infrastructure solutions. 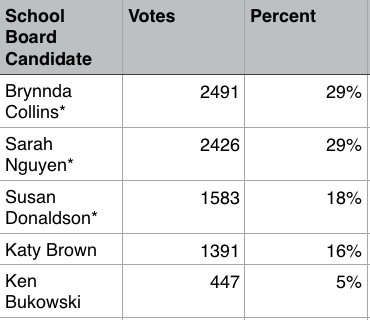 With all five precincts reporting tonight but the election results not final, the hotly contested Emery School Board race appears to have swung for two change agent candidates Sarah Nguyen and Susan Donaldson with 1149 and 781 votes respectively or 29% and 19% of the total vote. Incumbent Brynnda Collins who also can claim victory, garnered 1123 votes or 28%. Losers Katy Brown and Ken Bukowski are taking up the rear at 654 and 225 votes representing 16% and 5% respectively. The three winners are all endorsed by the resident activist group Residents United for a Livable Emeryville (RULE) as well as the Democratic Party of Alameda County. 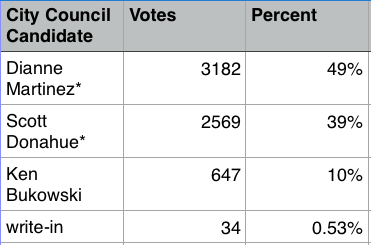 The City Council race is breaking as expected tonight with RULE backed incumbents Dianne Martinez and Scott Donahue winning with 1471 and 1191 votes reflecting 49% and 39%. Ken Bukowski came in at 319 votes or 10 %. 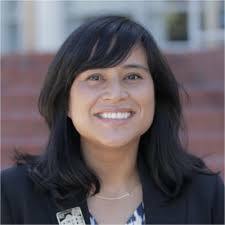 As Emeryville's election period begins, the Emery Teachers Association president, Ericka Castillo has drawn fire from community members. When she recently announced her union had used a democratic process in the selection for their School Board candidate endorsements, it was learned one candidate had been snubbed; Ken Bukowski. Mr Bukowski is now rightly asking how can the teachers union know not to vote for him if they didn't even hear his ideas for the District. The snubbing of Mr Bukowski and the democratic process represents an unfortunate soiling of the ETA's reputation as well as a disservice to Emeryville voters. 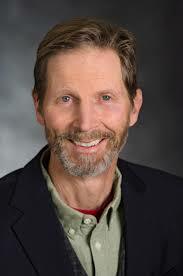 Mr Bukowski reached out to the Tattler to help the community hear his ideas for our schools the Emery Teachers Association isn't interested in hearing. Regarding the recent School Board endorsements, I would like to say the president of the Emery Teachers Association (the teachers union) is misguided about the election process. Of course, the ETA has the right to endorse whomever they wish and I was not endorsed this time. However, I take issue with a recent misleading statement about the School Board endorsements made by the president of the ETA, Ericka Castillo. She told the E’ville Eye blog her union’s candidate vetting process was fair; "the process was extensive and democratic” she said. Her comment is an insult. This misleading response makes you believe all the candidates were "extensively" considered, and apparently those not chosen were rejected. 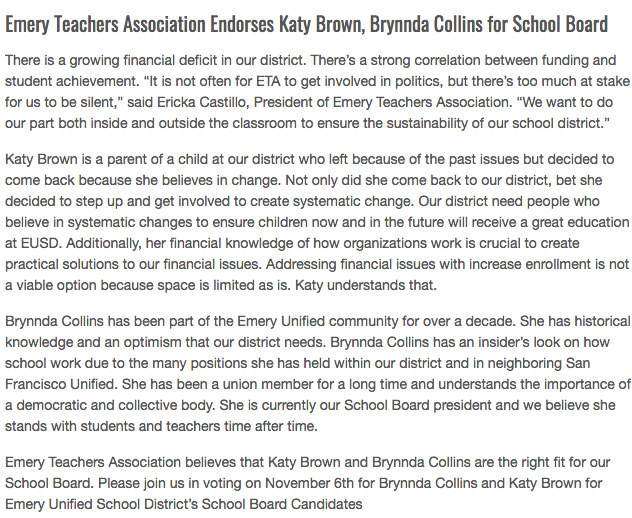 What she’s not admitting though is the ETA did not reach out to all the candidates for School Board. We were not asked to complete a questionnaire and not every candidate was interviewed. This in mind, I have to ask, what information was provided to the teachers to make the their ranked choice decisions? This highlights the ongoing problems the District has had with a lack of transparency. I'm running for the School Board because I'm concerned about the kids. I've seen this District go bankrupt twice. And now, we are on the same road again. The first time the state ordered the District to sell the Middle School, but (we) the City refused to re-zone the property to accommodate the buyer. Instead the school was leased and that money helped turn the District around. The second time it went bankrupt is when the District decided to operate three schools again. The City ultimately ended up bailing out the District. The City recognized the District could not afford to operate three schools so we combined all the children in one building so the City could help share the costs. The resultant ECCL was thus planned to help make the District solvent. However, at the last minute, the full $95 million bond issued to pay for the ECCL could not be sold in the bad market of the Great Recession. The project was consequently scaled back to reflect the new fiscal realities. But the necessary elements for the District to be solvent, formerly elucidated by a chaste School Board were simply eliminated. As you can see, we have a big problem. The Emery School District is top heavy with administration. The cost of operating a separate district takes away funds which could be used for the kids education. But there is a real opportunity for the District to develop teacher housing on the surplus sites (the former elementary and middle schools) thanks to a bill by Assemblyman Tony Thurmond created for this purpose. I talked with Tony about it for Emery and he said he would love to see his bill help leverage State money to supply teacher housing here. Having teachers in the community full time would be a great advantage. It's important for me to put these ideas on the table and I think it sets a bad example when you don't have a fair process from the ETA. I’m running for the Board to help the district avoid bankruptcy for a third time. Misleading information put out from those who are supposed to help is not appropriate. I sincerely hope the ETA can have a fair endorsement process in the future and show appreciation for every candidate. 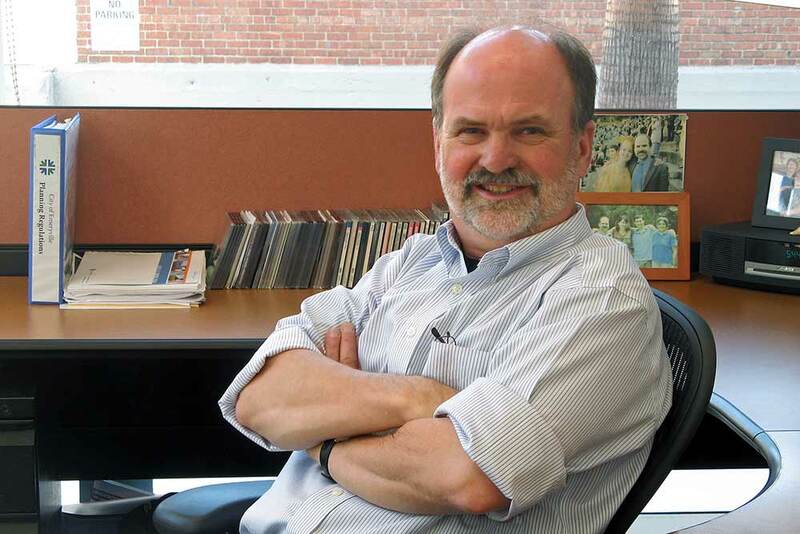 Emeryville’s General Plan sets forth principals and goals. Are there times when we need to amend our General Plan to account for unforeseen circumstances? Yes. That doesn’t mean that the spirit of the document has been violated. 1) Housing Affordability – The Emeryville community recently passed a $50M affordable housing bond. Council will be working diligently to prioritize projects that will leverage additional funding, and have the greatest impact. 2) Homelessness – The City has increased its investment into homeless services and expanded its homeless strategy to include support for a regional coordinated entry system, shelter beds and more. I will continue to support our efforts to get people off of the streets and to keep vulnerable residents from losing their homes. 3) Income Inequality – I’ve worked to institute a minimum wage that is a living wage, and a Fair Workweek policy that gives scheduling notice to our retail and fast food workers so that they can plan their lives. I am in favor of keeping labor policy enforcement strong in the City. In 2014, [Council member] Scott [Donahue] and I did campaign with “livability” as one of the tenets of our joint platform. In our time on Council, we have expanded the Emeryville greenway, and after many years of negotiation, we’re close to breaking ground on the South Bayfront Pedestrian / Bicycle Bridge. We also worked for a secure source of funding for the Emery Go-Round until 2023. City planners universally measure park and open space in terms of ‘level of service’ calculated by number of residents or users per acre of park land. Using these metrics, Emeryville is shown to be well below average among cities our size or indeed for any city in the Bay Area*. How can we get closer to average Bay Area levels of service for park land? Our General Plan calls for more green space, and I’m confident that the City will have real opportunities to realize this goal in the next ten years. I think that the residents per acre of parkland calculation can be useful in order to compare cities to one another, however, I believe that this measure does not stand alone when looking at the overall health of a City. The General Plan calls for 26 acres of new park land to be furnished by 2029, the date the Plan expires. However, since the Plan’s certification in 2009, Emeryville has added approximately two and a half acres*. Acknowledging it should reflect the desired and possible, do you think our General Plan should be amended to show less park acreage than it now proposes, owing to the reality of the large amount park land? I don’t think the General Plan needs to be amended. I think we need to keep lofty goals. As a County, we have a goal of less than 10% compostable or recyclable matter in our landfills by 2020. Are we close to that goal? No. Has that been our North Star for setting policy that is getting us closer to that goal? Yes. I think the biggest problem in the Bay Area (and in California) is our lack of affordable housing, and the lack of housing in general. My tenure on Council will reflect this prioritization. Over the last 25 years Emeryville has morphed from a city of homeowners into a city of renters as developers seek to maximize profits by building lots of rental only apartment buildings*. Is this something you’re satisfied with? If not, how will you address this issue? Home ownership is definitely better than rentals when you’re trying to create a deeply rooted and invested community. As a Council we can encourage, but not mandate, that residences be developed for purchase and not rental. We can focus some of the proceeds of our recent affordable housing bond measure to create more ownership opportunities. I'm willing to look at the data and make an informed decision. The parking plan is coming back before Council on October 30th. As you know, we have a new City Manager, and her analysis has not yet been presented to us. I do believe we need parking management. “Areas of Stability” is a phrase that appears in our General Plan. This does not mean there will be no change. From my point of view, Council (especially our mayor) and staff have worked diligently to carefully consider the removal of trees. I know of many trees that private entities have lobbied to remove, but have been saved. Brick and mortar retail is suffering as an industry, across the nation. The General Plan was written before this trend. One exception is cannabis related retail, which I have worked to bring to our City, beginning with my work in 2016 to lift our outright ban on cannabis and cannabis delivery. Now we have one operational dispensary and another on the way. Council has proposed a competitive tax scheme that should attract more businesses in the manufacturing, testing, and distribution sectors. I believe that creating a strong cannabis business center will indirectly and directly benefit other businesses in Emeryville. I presume you are asking about our Family Friendly Design Guidelines. One measure would be whether or not families are staying in Emeryville and keeping their children in our schools. We have already addressed this issue at Council. I have a problem with members of the public having access to AR-15s. 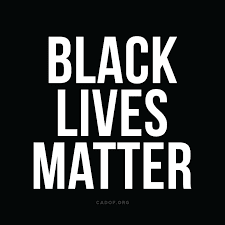 As pertains to Emeryville Police Department, I’m more concerned with “use of force” policy and de-escalation tactics than the actual tools they use to do their jobs. The Sherwin Williams project approval will not help Emeryville housing affordability (comes in at about 11% which is equal to our existing percentage) and the park acreage to be built will actually take Emeryville backward (527 Residents Per Acre versus Emeryville’s existing 472 RPA ). Also, as part of the approval, you signed a ‘Statement of Overriding Concerns’ that explained how this project is more important than building the Horton Street Bike Boulevard as per our Bike Plan's specifications. Given the park and bike problems associated with this project and considering our 200% of ABAG recommended market rate housing already built in Emeryville, why did you feel it was so important to OK this project? I take issue with the assumptions made in your question, but I’ll be brief in my answer. We are in a housing and affordability crisis – the worst I’ve seen in my lifetime. We are 2 million units short in the state. I think the ABAG recommendations are too low, and I don’t think that we stop building housing when we get to a recommended number when there are people on our streets and people at risk of losing their homes. In 2014 when you ran the first time, you both pledged to deliver ‘level four’ traffic calming for the Horton Street Bike Boulevard because the street was at ‘level three’ and the Bike Plan called for the next level to be implemented. A traffic count conducted before the election showed excess vehicle traffic on the street, necessitating the installation of level four traffic calming measures (as laid out in the Bike Plan). After the election, instead of bringing level four traffic calming, you both instead installed a new level three measure, thereby contradicting your promise. The Tattler several times asked for explanation from the two of you but you both chose not to explain your change of heart on this matter. Will you now tell Emeryville citizens why you did what you did? I accepted the staff recommendation. To my memory, this was approved by the BPAC as well. Also to my memory, not one member of the BPAC came to the Council to speak against the staff recommendation. Mystery Surrounding Mistake Riddled Teacher Attributed 'Door Hanger' Elevated by New Mistake Riddled "Press Release"
The president of the Emery Teachers Association issued a School Board candidate endorsement statement she called a "press release" Saturday containing grammatical errors that at least two teachers claimed to have no specific knowledge of today. The president, Ericka Castillo told the Tattler she wrote the mistake riddled "press release" for Tuesday's election but she insisted neither she nor the ETA had anything to do with an earlier printed election endorsement flyer placed on hundreds of Emeryville doors last week that also contained many errors. Ms Castillo's claim increases the mystery as reported in the Tattler as to the author of the earlier door hanger piece which in addition to the numerous grammatical errors, also claimed support of the endorsed candidates by what has turned out to be a phony election committee, 'Emery Families'. 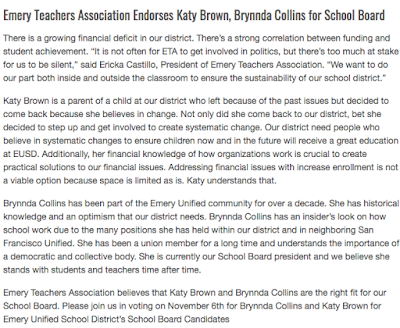 Emery's current School Board president Brynnda Collins, one of the two ETA endorsed candidates, told the Tattler that the ETA had authored the earlier 'door hanger' flyer, a claim denied today by the president of the ETA, Ms Castillo. In addition to that denial, Ms Castillo expressed the opinion that childless citizens have "no business" with Emery school doings in response to the Tattler's questioning. Saturday's error filled "press release" was not actually released to the press but rather simply forwarded to Rob Arias, the editor of Emeryville's conservative pro-business blog the E'Ville Eye who posted it, errors and all. 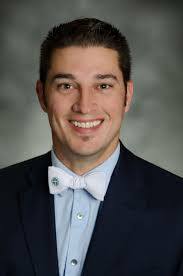 Teachers were made aware that their vote for their choices for School Board endorsement were going to be made public but apparently some if not all of them were not shown the actual document before it was presented to Mr Arias. Presumably teachers would have caught the errors if they had been given the chance to see how they're being characterized by their president, ahead of time. While denying authorship of last week's door hanger, Ms Castillo also took it upon herself to announce to the Tattler that citizens who don't have children enrolled at Emery schools have "no business" with the official proceedings at the public schools, a false statement. Public schools are public; paid for by the public and administered by the public. Emery schools especially have gone out of their way to encourage the public to take part in the running of the schools: the whole concept of the Center of Community Life is supposed to be dedicated to this democratic notion. California's Fair Political Practices Commission (FPPC), a five member independent non partisan state sanctioned commission has no record of any registered election committee named 'Emeryville Families' as the earlier door hanger piece announces and that false claim could constitute a violation of the California Political Reform Act of 1974 according to the FPPC. would be press release before it was released. The general plan is a direction, not a prescription. 1. Homelessness- Build supportive housing. Pressure Caltrans on the space behind Home Depot for health and safety cleanup. Continue to contribute to regional homeless social services. 2. Affordable housing- Build more affordable housing. 3. 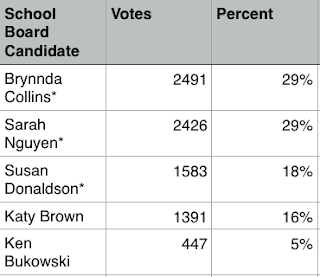 Improve our schools- Elect Sarah Nguyen, Brynnda Collins and Susan Donaldson for school board. Voters should assume all politicians are demagogues and then elect the most qualified ones to serve as actual council members. Berkeley has 516 residents per acre of Park, whereas Emeryville has 453 residents per acre of Park. Oakland is the exception with 67 residents per acre of Park, owing to the extensive parkland in the hills like Redwood Park. The issue has to do with developed parks for people who live in cities and would like to access parks by walking or biking. This question requires a lot more study to have a cogent answer. I disagree with the premise of this question. 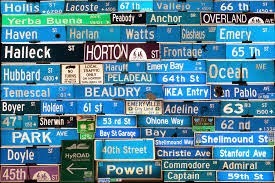 future condos? There might be a way. We start implementing what we've approved in the North Hollis area. to consider other areas of our city. Not only does this area have a number of single-family homes it has a plethora of secondary units on those properties. We will continue to allow secondary units in this area. I would enforce our Urban Forestry Ordinance. Create a vacancy tax and better specifications for retail. If we get more families. Yes if inexpensive includes police time in the calculation. The AR 15 rifle has been presented at the safety committee as one of our use of force tools. I am satisfied with our police department’s training for how and when this weapon can be used to protect the public. .50 caliber rifles are true military weapons and none of the criminals so far have advanced to organize military status where this weapon would be needed. If it is needed, it's not policing but rather war. We do not need weapons of greater lethality than the AR 15. We need a professional well-trained police force that can avoid the use of lethal weapons. The Sherwin Williams project approval will not help Emeryville housing affordability (comes in at about 11%* which is equal to our existing percentage) and the park acreage to be built will actually take Emeryville backward (527 Residents Per Acre versus Emeryville’s existing 472 RPA* ). Also, as part of the approval, you signed a ‘Statement of Overriding Concerns’ that explained how this project is more important than building the Horton Street Bike Boulevard as per our Bike Plan's specifications. Given the park and bike problems associated with this project and considering our 200% of ABAG recommended market rate housing already built in Emeryville, why did you feel it was so important to OK this project? I think your Park-acreage per resident facts are incorrect. The project itself has 17% affordable housing new park space and a shuttle to West Oakland Bart available to all Emeryville residents. Yes, our neighborhood will be more urban but we are getting amenities for the entire neighborhood. We chose traffic calming on Horton Street that we believed would be safest for bicyclists and pedestrians. When the traffic counts were last taken we came in under the amount specified for the street. After the Sherwin-Williams project is developed we will need to revisit our bicycle and pedestrian infrastructure on Horton Street.